A good kitchen whisk is an absolute essential for most commercial and domestic kitchens. Although primarily associated with baking, a kitchen whisk should be used for many popular meals too such as making scrambled egg, pancakes and gravy! We also stock a range of heat resistant kitchen whisks which are guaranteed to offer you quality whilst protecting your hands when whisking! Available in a variation of materials and sizes, the construction of our kitchen whisks ensures they are an economic and viable choice for any chef or baker who is cooking professionally. Save time and effort by using a whisk to mix and stir. 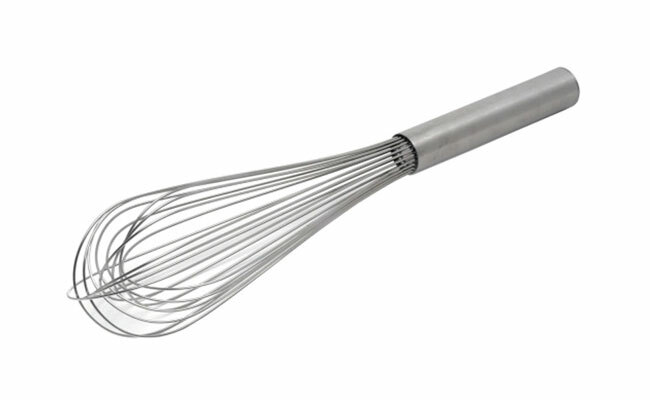 Get whipping and whisking quickly with our huge range of kitchen whisks which are available for next day UK delivery. At Pattersons Catering Supplies we stock an extensive range of kitchen tools and gadgets for professional chefs as well as serving & cooking utensils and kitchen equipment. FREE UK delivery is available on qualifying wholesale orders of kitchen whisks and kitchen utensils. Heavy Duty Nylon Handled Whisk 19.75"
Heavy Duty Nylon Handled Whisk 16"
Heavy Duty Nylon Handled Whisk 14"
Heavy Duty Nylon Handled Whisk 12"
Cambro Heavy Duty Whisk, 16"
Stainless Steel Wire Balloon Whisk 12"